With the increasing importance of networking services, backups, disaster recovery and application delivery – high quality network cabling installations are a necessity, It is also essential for todays wireless networks to be fully integrated with hard-wired network installations. Standards based, fibre optic cabling solutions are available from AJ Taylor across Sussex, Surrey, Hampshire, Kent and London. Our team work alongside you to understand your requirements and ensure that the correct capacity of cabling is installed into your business. Fibre optic cabling is generally used for backbone connectivity or for installations that require greater bandwidth, when data needs to travel longer distances, or when data travelling through the cable is of a more sensitive nature. 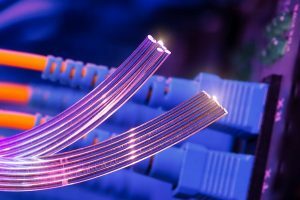 Fibre cabling is usually more expensive than its copper equivalent, but only when the interfaces, testing and transmission hardware is factored in, as the cable itself is very cost effective.